The curve of the new version eyelash is a little smoother than older version. 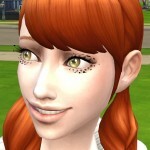 Also,I renewed the eyelash designs. Eyelash for Teen/YA/Adult/Elder,For All Gender. If you have any trouble,please check out this guide. EA eyelashes remover. This mod removes EA eyelashes. This remover is not applied to all sims automatically. You need to use individually this remover to your sims you want to remove EA eyelashes. 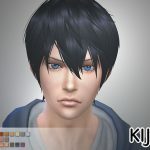 You can find it in the Skin Detail category and use it to your sim as a mole. EA eyelashes are removed when you use this remover,and EA eyelashes show up again when you put this remover off. 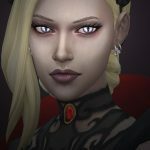 This Mod won’t work with older game version than pet patch. 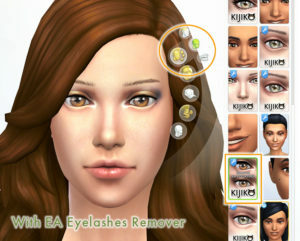 Use the remover to your sim in the Skin Detail category. EA eyelashes show up again when you put this remover off. 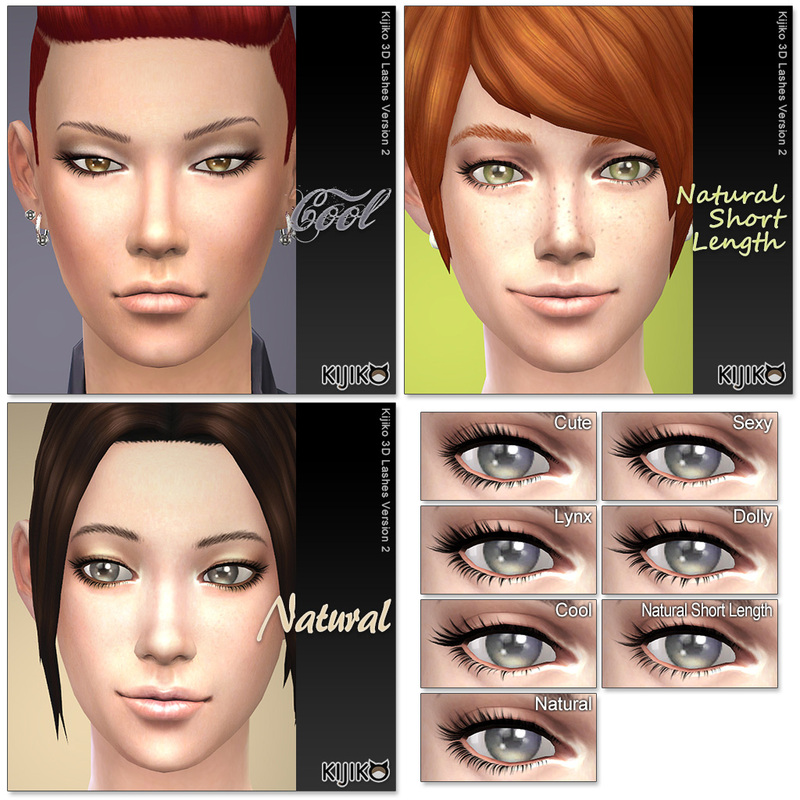 3D lashes HQ compatible version is available! This is an optional file for the lashes above. For Female and For Male included. Lashes do not work correctly in the laptop mode. 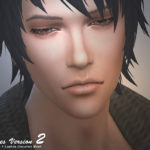 This eyelashes are used the ‘SimGlasee’ shader for texture alpha. Added the long eyelashes styles. 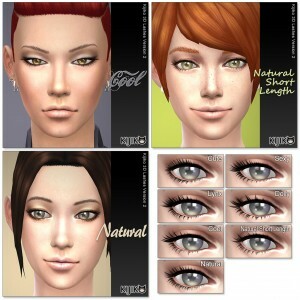 If you’ve already got my lashes (version 2),please overwrite the old files. 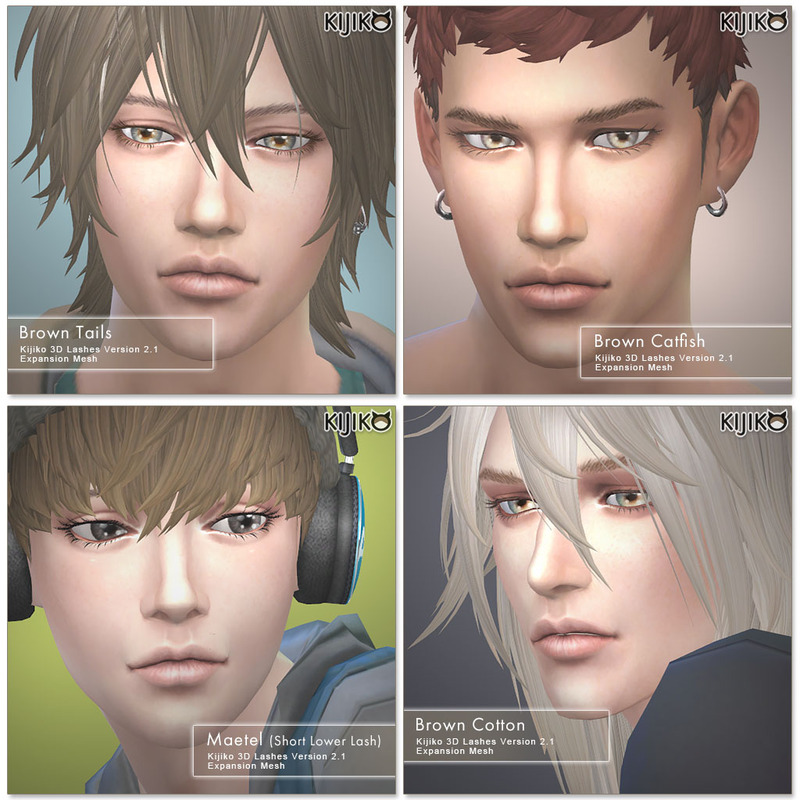 This is older version of the Lashes for people who can’t update the game for some reason. Unzip the all Zip.files before you put them in your mod folder. Please Do Not include my files in your upload. 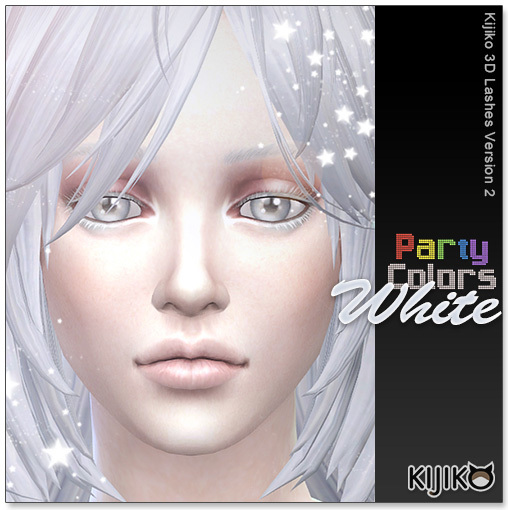 If you want to share your re-color or re-texture of these lashes,please Do Not include mesh data. This is older version than current download of the lashes. Because of that,I can’t identify the cause if something problem happens with your game because I can’t downgrade my game version. If you have any trouble,PLEASE CHECKE THE FOLLOWING THINGS before sending a comment. ･Check the .zip file has been unzipped correctly. If your archiver does not work correctly,try another archiver like 7zip or WinRAR. ･Make sure that your game has been updated to the latest. ･Go to the Game Options,check that “Enable Custom Content and Mod” has been turned on. ･Also,check that “Lap top mode” has been turned off. 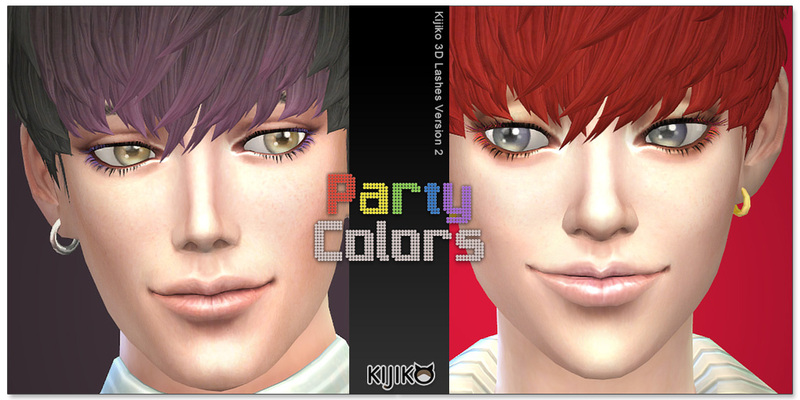 ･Put the main file named “[Kijiko]eyelash_YF_version2.package” into your Mods folder. It is required for using other lashes like long style lashes. ･Check that your Mods folder is not too much nested. 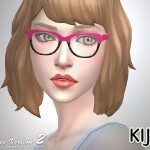 ･The lashes show up in the Glasses category. 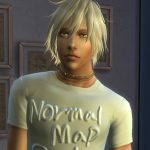 EA does not support Mods and Custom Contents. Please use it at your own risk. 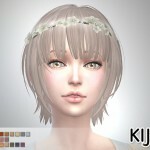 If you are not sure how to install custom contents,I recommend to search the internet for “How to install custom contents and mods”. I followed the instructions and it doesn’t work and also it is in the script mods folder right? Sorry but,what the script mods folder? As far as I know,TS4 makes the “Mods” folder in your ‘Documents\Electronic Arts\The Sims 4\’ folder when you boot TS4 first time. Then Custom contents and mods are recognized equivalently in that folder. 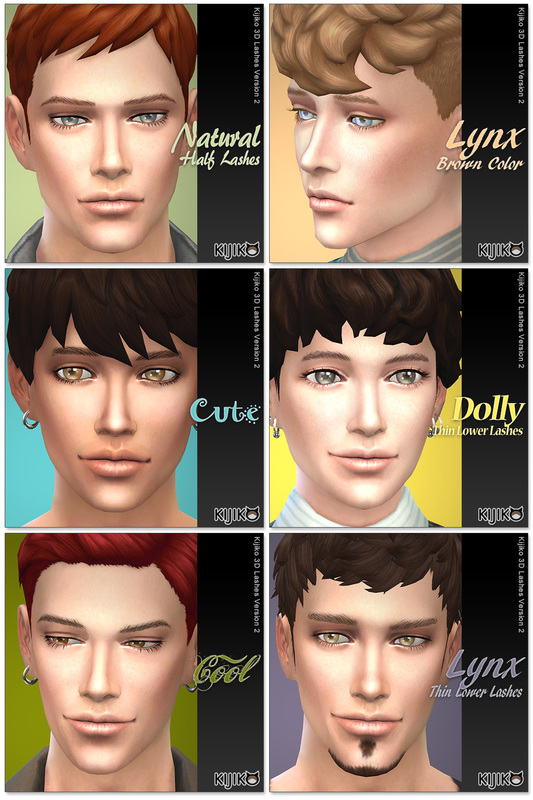 Also,this lashes are just custom contents,not script mods,so please make sure that .zip file is unzipped and then make sure that there are .package files. I have the same problem, you’re not alone. It doesn’t work for me either. Hi, I have an issue where the lashes glitch in my game. they become very thick and it looks like all her eyelashes are stuck together. I have checked and rechecked everything you’ve said to check and I’ve done everything correctly. 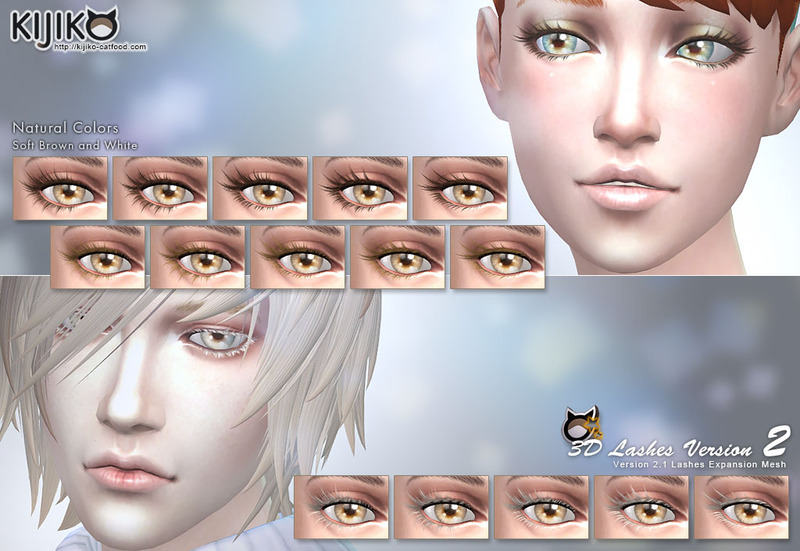 I have also taken out all my custom content except for the eyelashes and they are still very glitched out and clumped together. I don’t know what to do. like, what zip folder? Do i need to download the zip folder or where can i find it? and how do i download it? i’ve read the description and i’ve done like it says but it still doesn’t work. it’s probably really easy but i dont understand. and also, where do i find the original file? 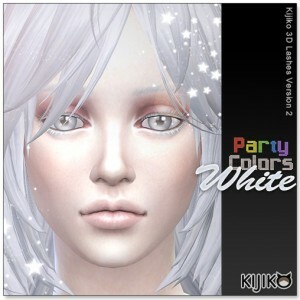 the one called “[Kijiko]eyelash_YF_version2.package”, it doesn’t show up in my downloads. and im sorry about my bad English, im Swedish thats why its so bad. I don’t have the main file in mine for some reason is there a download for the main file for them to work? How do you un-zip .zip files? It doesn’t work. I keep following the instructions but they just don’t show up in my game. 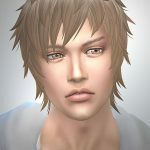 I even tried deleting the eyelashes and downloading them again and waiting a little bit more for the file to be unzipped. Still doesn’t work which makes me really bummed out because I really wanted these eyelashes in my game because they are really cool and beautiful. I even tried searching up videos on how to download them but all that shows up is Custom Content Favorites, Custom Content Shopping, etc. Can you please tell me how to correctly download them?